Here you will find all the projects I have completed for my DTC 201 class at WSU. This first project is a collage created in Adobe Photoshop. The project is a product of the novel Ready Player One by Ernest Cline. 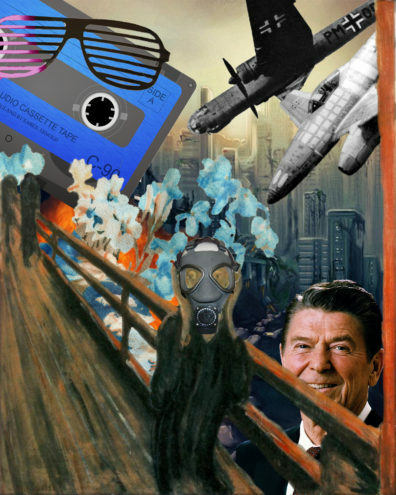 The idea was to use a handful of smaller images to create a bigger, entirely unique collage with a dystopian theme, using elements from the 1980’s. I cropped, recolored, and resized galore to make this image come together. The second project I completed for the class is a poster for an avatar that may exist in the Virtual Reality world of the OASIS, the online globe that every character in the novel Ready Player One logs into to live their fake lives and escape their gloomy real ones. 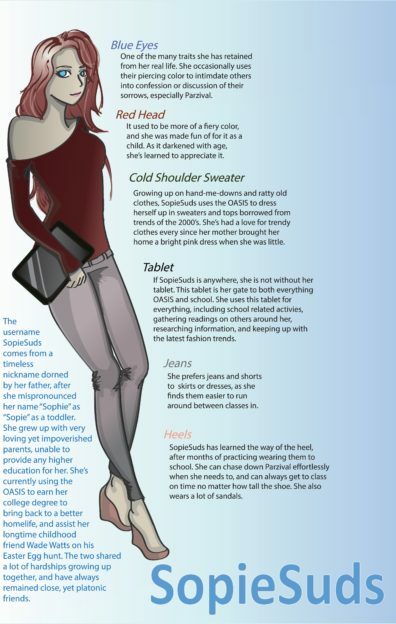 The project required a certain poster look, with areas of text describing how the avatar fits into the OASIS. For this project, I used Adobe Illustrator to hand-draw the avatar. For this project, we were instructed to interview a person from a different time about how media or technology influenced their generation. We were instructed to interview the person for about twenty to forty minutes, and then edit the interview down to four to five minutes. To edit my interview of my mom, I used the free program Audacity.